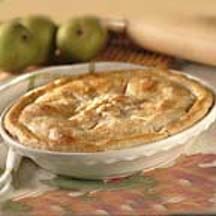 Nothing beats the smell of apple pie baking in the oven, and this variation is as easy as pie! Place 1 pastry in 9-inch pie plate. Combine escalloped apples, sugar, flour, cinnamon and nutmeg; spoon into shell. Place remaining pastry on top of apple mixture; seal and flute edges. Cut slashes in pastry. Brush pastry lightly with milk; sprinkle with additional sugar. Bake for 50 minutes or until crust is golden brown.